EverEscents Organic Hair Care – treat yourself to the exclusive all natural and organic hair care collection attracting rave reviews from across Australia and the world. EverEscents is dedicated solely to high performance professional organic and natural hair care and is Australia’s own professional quality organic hair care company. Australian owned & made. Even the bottles & labels! There is no substitute for lush, healthy, shining hair. I am proud to say that our organic hair care collection contains the finest plant based and Certified Organic ingredients available. We are so excited about these products and I am sure that you will feel the same. The EverEscents Organic Hair Care Range is brought to you by a group of passionate and energetic individuals dedicated to providing a real alternative in the professional hair care market. EverEscents is a 100% Australian company and is headed up by a Queensland couple named Julia and Luke Charters. The passion is driven by a commitment to offer a stylish, contemporary range of ethical products that are 100% Australian made and environmentally responsible. This mission has strong foundations and the direction came from an early start with an inspiring individual that founded the EverEscents legacy, her name is Leone Martin. In 1998 a spirited Leone Martin had a pivotal moment in her life when her grandmother was diagnosed with Lymphatic Cancer. Leone was very close to her grandmother and to see her facing the end of her life much sooner than she deserved was what started Leone on her quest. During the medical treatment they started using natural products and taking supplements and amazingly she began to look great and feel better mentally and physically. Despite the doctors warnings that Leone’s grandmother may not see out the year she went on to live for 8 strong years and was able to attend Leone’s wedding and see the birth of her first child. What a gift it was for both of these wonderful women to be able to share so much together even after being diagnosed with such a crippling disease. During Leone’s life journey with her grandmother her efforts were directed into sourcing natural and organic products of many different kinds. Leone started researching all the ingredients used in hair care, cosmetics and personal care products and was astounded at the chemical ingredients that would be allowed to be put into products for humans. During this quest for the truth and genuine natural products it became suddenly clear that Leone had grown a passion for developing her own range of absolutely amazing products that would be natural, organic and safe. Through all of Leone’s research and studies of aromatherapy and regenerative skin care, she discovered not only the questionable ingredients used in mainstream hair care and cosmetic products but also that some really great ingredients existed that could be used as substitutes. Leone realised that she could reach an audience that had previously not been reached. She could provide a range of products for the modern world and could then also be completely comfortable knowing that her family will also be using a safe, ethical product. It was from that point that EverEscents Organic Hair Care Products was born. Further research and a partnership with a cosmetic scientist who was also interested in working towards producing natural products got the wheels in motion. The main focus being hair care because it was difficult to find natural and organic hair care that actually worked by leaving all types of hair feeling great – not oily and not dry. The formulas were developed and the results started to speak for themselves. EverEscents had created something that thousands of people had been searching for – a professional salon quality organic product that actually works! Soulstyle Organic Hair stock the EverEscents range of professional Organic hair care. Through years of extensive research in conjunction with world class hairdressers, highly respected cosmetic scientists and the natural health care industry. EverEscents Organic Hair Care has formulated the range. 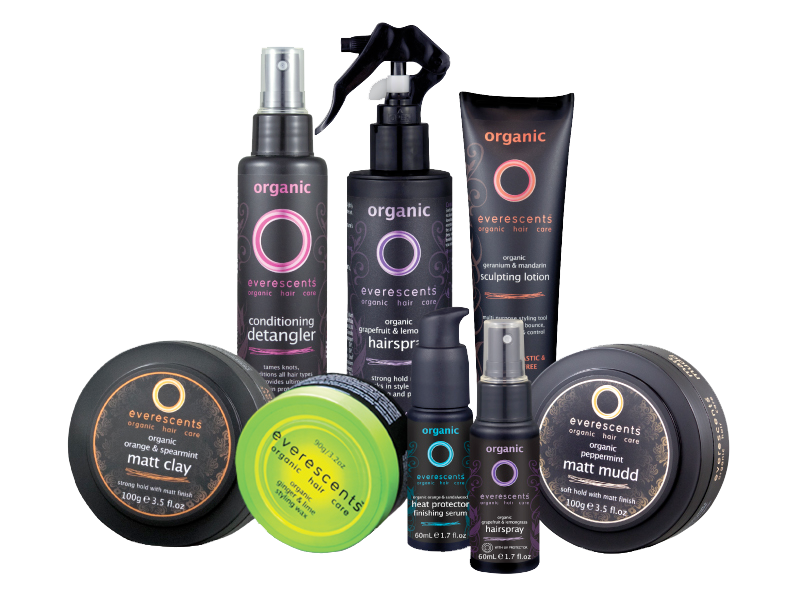 It is an amazing collection of high performance organic hair care products that are revolutionising the way we see natural hair care. The whole collection smells great, is great for you, enhances the manageability of your hair and is full of natural goodness. EverEscents is your ticket to certified organic ingredients and formulas that address your needs while also addressing your concerns. Try it for yourself and immerse yourself in the wonders of EverEscents Organic Hair Care – you deserve it!